Former University of Houston volleyball star Flo Hyman’s spike was once measured at 110 mph. Back when she attended the University of Houston, Flo Hyman took a “Coaching Volleyball” course overseen by her own coach, Ruth Nelson. Nelson gave Hyman a ‘C’ in the class. That’s because as a volleyball player — and really as a person — Hyman was a straight-A performer. The same could be said of Rita Buck-Crockett, Hyman’s friend and former teammate at Houston. No matter what volleyball coach or expert you ask, the consensus is that Hyman and Buck-Crockett both rank among the game’s all-time great players. So the fact that the duo are the first volleyball players ever to earn induction into the Texas Sports Hall of Fame seems only fitting. It’s kind of like when Babe Ruth and Ty Cobb were inducted into the National Baseball Hall of Fame. As a young girl growing up in Inglewood, Calif., Hyman was always unnaturally tall for her age. Her sister, Bobbi Bedford, recalled Hyman being 5-foot-9 in the third grade. Everyone expected her to play basketball, but Hyman was instead attracted to that other sport often played by taller girls, volleyball. Hyman was self-conscious about her height growing up, but her mother, Warrenne, instructed her to be confident and proud. Hyman grew to be 6-foot-5 and developed into one of the top volleyball players in the country, with a spike that was once clocked at 110 miles per hour. 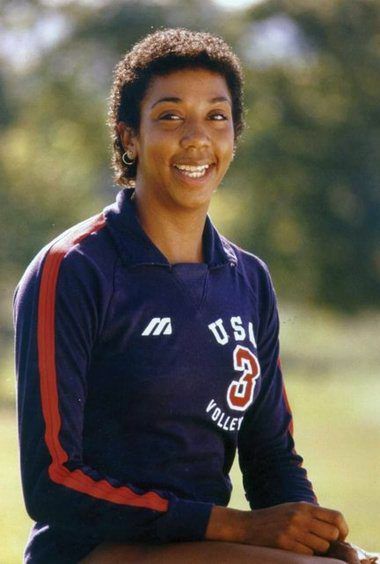 She was so advanced for her age that she was invited to join the U.S. National team in 1974, as a high school player. It was there she met Nelson, who also played for the national team in addition to coaching at Houston. Nelson offered Hyman a full scholarship, and she became Houston’s first female scholarship athlete. However, Hyman declined to accept the full cost of the scholarship so other athletes could benefit as well, Nelson said. Despite Hyman’s prodigious size and power, Nelson installed her as Houston’s setter. Hyman possessed a playful, fun-loving personality, and she used it to have fun with her coach. Hyman dominated matches at Houston and was named an All-American three times. She skipped her senior year to devote more time to Team USA, and then ventured to Japan to play professionally. She had first visited Japan while with the Lady Cougars, and the people there fell in love with Hyman right away. During Hyman’s pro career with the Daiei women’s squad, she also began acting and modeling. In 1985, she appeared in a movie entitled “Order of the Black Eagle” in which she played a knife-wielding character named Spike. In January of 1986, Hyman and her Daiei team were playing a game against Hitachi in Matuse City, Japan. While sitting on the bench during a substitution, Hyman collapsed and later died. What was initially thought to be a heart attack was later found to be a symptom of Marfan’s Syndrome, which had previously gone undetected. Hyman was mourned both in the U.S. and abroad. In Japan, billboards paid tribute to her legacy. Her funeral in California drew more than 500 friends and family. Unlike Hyman, Buck-Crockett pursued a variety of athletic endeavors as a child. She was raised in a poor neighborhood in San Antonio, and she recognized that athletics – whether basketball, track or volleyball – might provide an escape. She also found a college scholarship. She initially played volleyball and basketball at San Antonio Junior College before transferring to North Texas. But at the time the volleyball hub of Texas was located at Houston, and she transferred again, joining up with Nelson and Hyman for the Lady Cougars. While in Houston, she elevated to new heights — literally. Buck-Crockett was selected to the U.S. Olympic team in 1980, but wasn’t able to compete after the United States boycotted the games in Moscow. Fortunately, four years later, she finally was able to soak in the entire Olympic experience in Los Angeles. Buck-Crockett ended up playing professionally for 16 years, on teams in Japan, Switzerland and Italy. In Switzerland, she met her future husband. For a girl who grew up in poverty, seeing the world while being paid to play a sport she loved proved a little mind-blowing. Today, Buck-Crockett works as the head coach of the Florida International University’s beach and indoor volleyball teams. She said she gained an understanding and appreciation for coaching the deeper she traveled in her pro career, and she always wanted to be an advocate for minorities striving for an education. During Buck-Crockett’s time as a pro in Japan, she reunited with Hyman, as the two became teammates again. She called Hyman “the big sister she never had” and was with her at the game on the day she died. Buck-Crockett said that she found herself overcome with emotion when she received the call from Texas Sports Hall of Fame vice president Jay Black that she’d been voted as an inductee. The fact that her old volleyball “sister” Hyman was joining her made it all the more special. “It’s awesome,” Buck-Crockett said. “I mean, we’re making history together again. This is the first in a series of profiles on the Texas Sports Hall of Fame induction class. Other inductees include Cowboys great Darren Woodson, longtime NFL coach Wade Phillips, former Texas A&M and L.A. Rams star Dave Elmendorf, Olympic gymnast Nastia Liukin, A&M track coach Pat Henry and former Texas and NFL running back Eric Metcalf. Eric Metcalf didn’t have to look far to find his role model.